Returns the age of this entry in frames. Returns the age of this entry in seconds. Returns the name of the avatar. Whether the avatar is a Linden. Sets a custom title for the account. Gets the custom title for the account. Sets the activity type for this avatar. Sets the 'focus' status on this entry (camera focused on this avatar). Returns whether the item is dead and shouldn't appear in the list. Timer to keep track of whether avatars are still there. Last frame when this avatar was updated. This class is used to hold data about avatars. We cache data about avatars to avoid repeating requests in this class. Instances are kept in a map<LLAvatarListEntry>. We keep track of the frame where the avatar was last seen. Avatars that are old enough are not added to the visible list, but still kept around to cache the account info data (like the birth date and the payment data). Definition at line 353 of file llfloateravatarlist.h. Definition at line 364 of file llfloateravatarlist.h. 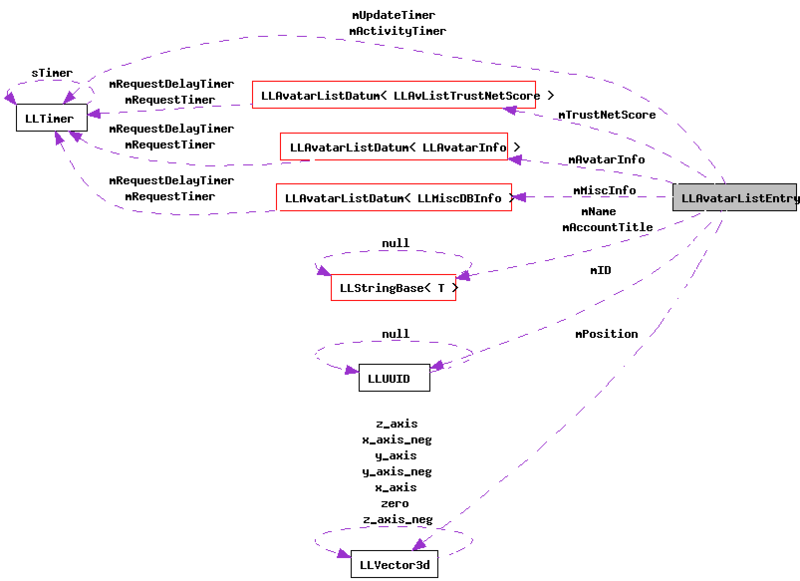 References f, gFrameCount, mFrame, mTrustNetScore, LLAvatarListDatum< T >::setMaxPending(), and LLAvatarListDatum< T >::setRequestDelay(). Definition at line 189 of file llfloateravatarlist.cpp. Definition at line 205 of file llfloateravatarlist.cpp. References ACTIVITY_NONE, ACTIVITY_TIMEOUT, LLTimer::getElapsedTimeF32(), mActivityTimer, and mActivityType. This is only used for determining whether the avatar is still around. Definition at line 138 of file llfloateravatarlist.cpp. Definition at line 143 of file llfloateravatarlist.cpp. Definition at line 162 of file llfloateravatarlist.cpp. Referenced by LLFloaterAvatarList::focusOnNext(), LLFloaterAvatarList::focusOnPrev(), LLFloaterAvatarList::luskwoodCommand(), LLFloaterAvatarList::onClickTrustNetExplain(), and LLFloaterAvatarList::refreshAvatarList(). Definition at line 176 of file llfloateravatarlist.cpp. References LLAvatarInfo::Account, ACCOUNT_EMPLOYEE, LLAvatarListDatum< T >::getValue(), mAvatarInfo, and mIsLinden. Definition at line 157 of file llfloateravatarlist.cpp. Referenced by LLFloaterAvatarList::getSelectedNames(), LLFloaterAvatarList::luskwoodCommand(), LLFloaterAvatarList::onClickTeleport(), LLFloaterAvatarList::onClickTrustNetExplain(), and LLFloaterAvatarList::refreshAvatarList(). Definition at line 133 of file llfloateravatarlist.cpp. Referenced by LLFloaterAvatarList::onClickTeleport(), and LLFloaterAvatarList::refreshAvatarList(). Definition at line 225 of file llfloateravatarlist.cpp. Referenced by LLFloaterAvatarList::focusOnNext(), LLFloaterAvatarList::focusOnPrev(), and LLFloaterAvatarList::refreshAvatarList(). Definition at line 439 of file llfloateravatarlist.h. Definition at line 220 of file llfloateravatarlist.cpp. Definition at line 183 of file llfloateravatarlist.cpp. References LLAvatarInfo::Account, ACCOUNT_CUSTOM, LLAvatarListDatum< T >::getValue(), mAccountTitle, and mAvatarInfo. Has no effect if the specified type is lower priority than the current one. Definition at line 196 of file llfloateravatarlist.cpp. References ACTIVITY_TIMEOUT, LLTimer::getElapsedTimeF32(), mActivityTimer, mActivityType, and LLTimer::start(). Referenced by addParticleSourcesToList(), LLPipeline::postSort(), setPosition(), and LLAgent::startTyping(). Definition at line 437 of file llfloateravatarlist.h. Referenced by LLFloaterAvatarList::focusOnNext(), and LLFloaterAvatarList::focusOnPrev(). Definition at line 167 of file llfloateravatarlist.cpp. References llendl, llwarns, and mID. Definition at line 148 of file llfloateravatarlist.cpp. References llendl, llwarns, and mName. Update world position. Affects age. Definition at line 121 of file llfloateravatarlist.cpp. References ACTIVITY_MOVING, gFrameCount, mFrame, mPosition, mUpdateTimer, setActivity(), and LLTimer::start(). Definition at line 215 of file llfloateravatarlist.cpp. Definition at line 452 of file llfloateravatarlist.h. Definition at line 463 of file llfloateravatarlist.h. Referenced by getAccountCustomTitle(), and setAccountCustomTitle(). Definition at line 477 of file llfloateravatarlist.h. Referenced by getActivity(), and setActivity(). Definition at line 461 of file llfloateravatarlist.h. Definition at line 466 of file llfloateravatarlist.h. Referenced by LLFloaterAvatarList::getAvatarColor(), getIsLinden(), LLFloaterAvatarList::processAvatarPropertiesReply(), LLFloaterAvatarList::refreshAvatarList(), and setAccountCustomTitle(). Definition at line 458 of file llfloateravatarlist.h. Referenced by isFocused(), and setFocus(). Definition at line 482 of file llfloateravatarlist.h. Referenced by getEntryAgeFrames(), LLAvatarListEntry(), and setPosition(). Definition at line 454 of file llfloateravatarlist.h. Definition at line 459 of file llfloateravatarlist.h. Definition at line 457 of file llfloateravatarlist.h. Referenced by isMarked(), and toggleMark(). Definition at line 467 of file llfloateravatarlist.h. Definition at line 455 of file llfloateravatarlist.h. Definition at line 456 of file llfloateravatarlist.h. Definition at line 465 of file llfloateravatarlist.h. Referenced by LLFloaterAvatarList::getAvatarColor(), LLAvatarListEntry(), LLFloaterAvatarList::processTrustNetReply(), and LLFloaterAvatarList::refreshAvatarList(). Definition at line 472 of file llfloateravatarlist.h. Referenced by getEntryAgeSeconds(), and setPosition().